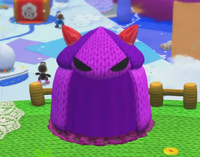 The Boss Tent (also called Boss Hut) is a tent in Craft Island, in Yoshi's Woolly World. It is unlocked by completing the course King Bowser's Castle. In the Boss Tent, players can face off against each of the twelve bosses in the game, but each boss moves much faster than normal, making the boss fights more difficult as a result. At first, players are limited to which bosses they can fight, but by defeating a boss, they can advance to the next boss. Defeating a boss also rewards players with one or two pieces of Wonder Wool. The bosses mentioned below are fought in the same order as they're encountered in the main game. Bronze Yoshi: Collect 5 Bronze Wonder Wool. Silver Yoshi: Collect 5 Silver Wonder Wool. Gold Yoshi: Collect 5 Gold Wonder Wool. This page was last edited on September 18, 2018, at 14:17.